Jewish life in England goes back almost 1000 years. It is believed that the first Jews were brought over from Normandy by William the Conqueror in 1066; there is reference to Jews in Oxford as early as 1075, and the Domesday book of 1086 records the Jew Mennasseh owning land in Oxfordshire. Several Baalei Tosfos lived in England including R.Yaakov MiOrleans (martyred in London at the coronation of Richard the Lionheart in 1189), R. YomTov MiYoigny author of Omnam Kein recited on Yom Kippur Maariv (martyred in the York massacre of 1190) and the R'i MiLondri mentioned in the Remo in Hilchos Pesach (Siman 473 Sif 76 ) as recommending the recitation of the Hagadah in the vernacular. In 1290 however Jewish life in England came to abrupt end when the Edict of Expulsion was proclaimed by King Edward I, resulting in the banishment of the entire Jewish Population from Britain. The Edict was issued on 18th July, which that year was the Fast of Tisha B'Av. England remained "Yudenrein" until 1656 when R. Menashe Ben Israel successfully petitioned Oliver Cromwell to allow the readmission of Jews. It is said that Menashe Ben Israel pressed Oliver Cromwell on the grounds that England -Angleterre- was one of the four "angles" of the earth referred to in the prophecies of the ingathering of the exiles, and thus resettlement would hasten the coming of the Messiah! 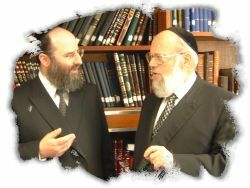 Within only 50 years the offices of Chief Rabbi and Beth Din came into being to provide central religious authority for Jewish communities in London and throughout the United Kingdom-a role reflected in the London Beth Din's official title "D'Kehila Kedosha London Bet Din Vehamedina" - The Beth Din of London and the Country. This national role has become increasingly important in recent years with the decline of Jewish communities and local Botei Din in the provinces. Amongst the early Chief Rabbis who helped establish the central orthodox authority for which the UK is renowned was R. Dovid Tevele Schiff (Chief Rabbi 1765-1791) whose pirush on the Mishnah, Lashon Hazahav, is printed in the Yachin Uboaz Mishnayos, and R. Nosson Adler (Chief Rabbi 1845-1890) author of the famous commentary on the Targum Nesina LaGer. In 1934 the prestige of the London Beth Din as a world ranking halachic authority was greatly enhanced with the appointment of the Gaon HaRav Yechezkel Abramsky (the (Chazon Yecheskel) as Rosh Beth Din. 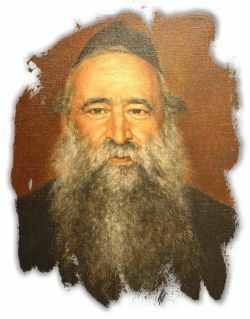 Although other renowned Talmidei Chachomim served both during and since his time - such as Dayan Arieh Leib Grosnass (Lev Aryeh) and Dayan Rapaport (Be'er Avroham), it was Dayan Abramsky above all who established the policies and Hanhagos that are followed by the London Beth Din to this day. For the past 16 years the Rosh Beth Din has been HaRav HaGaon Rav Chanoch HaCohen Ehrentreu Shlita formerly Rosh Beth Din and Communal Rabbi of Manchester, and previously Rosh Kollel Sunderland. Serving together with him is Dayan Menachem Gelley Shlita (son of R. Zacharia Gelley of Washington Heights), Dayan Binstock, and Dayan Yitzhak Berger (Consultant). The title of Av Beth Din is formally held by the Chief Rabbi Dr Jonathan Sacks whose high profile as an international religious leader, and author and lecturer of renown has done much to enhance the stature of orthodoxy amongst irreligious Jews and non-Jews alike. By dint of his workload as well as convention of his office, the Chief Rabbi is not involved in Beth Din work. The activities of the London Beth Din encompass all aspects of Beth Din work including Dinei Torah, Gittin, Gerus, Shechita, Kashrut, Personal status, and all the shailos and problems of major kehila life. The central authority of the London Beth Din is such that by convention neither the Kedassia, Manchester, nor Sephardi Botei Din carry out Gerus in the UK and virtually all authority in this critical area is delegated to the London Beth Din. The Beth Din is affiliated to the United Synagogue, the main orthodox synagogue grouping in the U.K., which was established by Act of Parliament in 1870. The U.S. has 66 Shuls throughout London and maintains the full spectrum of orthodox Kehilla facilities including schools, chadorim, Mikvaos, Chevra Kadisha, Botei Olom and Youth programmes. Any profits from Kashrut Division activities goes to support the Beth Din and the United Synagogues communal work. 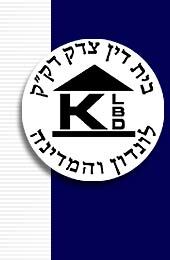 The largest single department of the London Beth Din is the Kashrut Division, encompassing licensing of over 70 restaurants, hotels, bakeries and similar establishments, supervision of some 3000 catered events per year, and certification of almost 700 factories worldwide. Licensees must be Shomrei Shabbat and actively involved in the business. Licences are not granted to hotels to do their own catering. Caterers must own all their own equipment and may not kosher and utilise hotel keilim. All catering and meat restaurants must have full time hashgocha from beginning to end. All Mashgichim must be employed by the Beth Din and may not receive any pay or bonuses from the caterer. Hotel dishwashers may not be used and equipment must be washed at caterer's base or by hand in bowls. All dairy products must by Chalav Israel. Notwithstanding these strict standards, London Beth Din caterers cater regularly in London's most prestigious five star venues, including Claridges, the Dorchester, the Guildhall, and many others. A recent highlight of the catering operation was the supervision of a kosher state banquet in Buckingham Palace to celebrate the state visit of the Israeli President. To conform with Royal protocol, the Beth Din made an exception and allowed the koshering of the Royal salvers and tureens, cutlery and even "crockery" - Buckingham Palace "crockery" is solid gold! All Mashgichim have shimush with an experienced colleague for several weeks before being sent out "to the front line", and regular training seminars are held (including courses on hygiene and environmental health). Sadly the limited size of the UK Jewish population is such that the vast majority of manufacturers are uninterested in the placing of any kosher logo on their products. Thus in order to provide reliable guidance on local products to both natives and tourists, the Kashrut Division produces "The Really Jewish Food Guide" listing several thousand products whose status have been approved by the Beth Din on the basis of research by our Food Technologists into ingredients, processing aids, and any shared use of equipment. This guide is the Anglo Jewish bestseller, and is regarded as an essential requirement of Jewish life from Golders Green to Gateshead, and from Plymouth to Aberdeen. Kosher certification of factories by the London Beth Din goes back at least a century. A letter from Chief Rabbi Adler in 1902 grants his sanction to Marmite - a product still certified today in bulk form (although the retail jars packed in the UK are not approved). Similarly Frys Cocoa bore "the sanction of the Ecclesiastical Authorities" all the way back in 1910. Over the years the London Beth Dins strong links with the far-flung communities of the British Empire ensured that the London Beth Din's halachik influence was worldwide. As long ago as 1830, in the early years of settlement in Australia, Dayan Aaron Levy of the Beth Din was sent on a mission to "the other side of the world" to be Mesader Gitin for the new colonists. To this day the formal title of Rabbi Sacks is "The Chief Rabbi of the United Hebrew Congregations of the Commonwealth". These historic links with Australia, Malaysia, India and other Commonwealth countries, together with the shrinking of distances and globalisation of world markets over the past decade in particular, has resulted in the London Beth Din becoming one of the major forces in international kosher certification. Indeed as a leading Rav and Kashrut Authority in Eretz Israel recently put it, there can be barely a product in Israel which does not contain a London Beth Din certified ingredient. Whilst other authorities have concentrated on granting Hechsherim to finished products, the London Beth Din's area of expertise has become raw materials and speciality ingredients. Flavours, colours, emulsifiers, food chemicals, dairy derivatives and vitamins are examples of the key ingredients where most of the major European Manufacturers are KLBD certified. Once again, in order to maintain high standards of control, the London Beth Din has an integrated team of Rabbinic Coordinators, each with their own area of expertise. Flavour technology is perhaps the most complex area of ingredient manufacture, certainly from the viewpoint of Kashrut. A flavour can commonly be made of twenty components, each one themselves composed of 10-20 sub-ingredients. When certifying a flavour, it is not uncommon to receive a print out of the "split formulation" of ten to twenty pages. In one notable case, a formulation split back for seventy pages! Each ingredient, and sometimes each supplier must be traced back to source and be kosher certified or approved. All the leading European flavour houses such as Sensient, International Flavour & Fragrance (IFF), Givaudan, and CPL use the London Beth Din for their Kosher Certification. Dr Moshe Rosenfeld, an expert flavour chemist and graduate of Imperial College London and Yeshivos in Manchester and Jerusalem, utilising a specially designed flavour database, controls this intricate and sophisticated process. Dr. Rosenfeld's specialist knowledge is much sought after by other Kashrut Agencies and manufacturers worldwide. The Dairy industry is another area where a high degree of expertise is required for reliable kosher control. The London Beth Din was amongst the first, if not the first, Kashrut authority to recognise the kosher problems in many milk derivatives. Casein -milk protein for example is akin to cheese and thus may only be kosher if produced under full time hashgacha - Gvinas Yisroel. Apart from the problems of properly koshering a huge casein plant and maintaining supervision during two week long 24 hour productions (including Shabbos to make sure production does not take place! ), a substantial derivative of cheese and casein production is whey, and several other dairy ingredients, lactose, proteins and even minerals may be derivatives of non-kosher whey. Thus potential problems in blends of dairy derivatives are myriad. The London Beth Din is fortunate to have the expertise of Rabbi Akiva Padwa, grandson of R. Chanoch Dov Padwa OBM as Rabbinic Co-ordinator and Senior Inspector for our dairy plants across the U.K. and Ireland, Europe and Australia. Although the UK is hardly renowned for its vineyards, the London Beth Din has become very active in Hashgacha of wine in Spain, Italy, Chile, and Australia. From Chile comes some highly commended Merlots and Cabernets with Lanzur and Welner labels, whilst in Australia the London Beth Din is responsible for the production of Carmel brand Vintage Cabernet, Merlot, Chardonnay and Vintage Padthaway Chiraz. From Spain, comes the world famous brand leader Tio Pepe Sherry. Sherry, though essentially a fortified wine, is produced through the Solaro system, a complex interblending of vintages, so that there is a minimum of 4 years between first pressing and bottling! (A serious investment!) Like all wine production, not only the hashgacha but the entire manufacturing process must be done by Shomrei Shabbos Yidden, from tipping of the lorries carrying the grapes through operating the presses, switching on the pumps, taking the samples, right through to operating the bottling plant. Because of the complexity of the process and the ever present Halachic issues, Dayan Ehrentreu himself heads the team of a dozen Gibraltar Kolel yungerleit who take over the Bodegas each pressing season. Another key product with London Beth Din supervision is Rakusens Matza. The Leeds bakery with its state of the art non-stick surfaces, high pressure air jets, and uniquely insulated Pi Hatanur, has been commended by many visiting experts as one of the finest Matza bakeries in the world. (The renowned Gateshead Rav, R. Betzalel Rakov Shlita bakes his Kehila Matzos here.) The full time Rav Hamachshir for Rakusens on behalf of the Beth Din is HaRav Sadia Amor Shlita of Manchester. Not withstanding their heavy workload, both Dayan Ehrentreu and Dayan Gelley are directly involved in both the Psak and the LeMaase of London Beth Din Hashgacha. 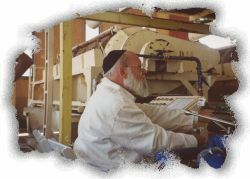 For wine production in particular, the koshering of casein plants and other major factories, and whenever complex Kashrut issues come up, the London Beth Din Dayanim fulfil literally the Halachic phrase : "Kefi Re'ut Enei Hadayan" and don't hesitate to come on site to view the situation with their own eyes. On a daily basis however, the Kashrut Division operates under the leadership of its Director, Rabbi Jeremy Conway, a graduate of Gateshead Yeshiva, The Mir in Jerusalem and Kolel Chacham Zvi in Amsterdam. Formerly the Rov of the Beth HaMedrash HaGadol in Leeds, he was approached by Dayan Ehrentreu and appointed to head the Division in 1988. Under his direction the Department produced the Really Jewish Food Guide, launched a website (www.kosher.org.uk), developed the KLBD Logo, and expanded and improved the entire hashgacha system. Rabbi Conway is a popular lecturer and broadcaster, and has delivered several keynote addresses to European Food Industry conferences. Other senior Rabbonim in the department are Rabbi Zvi Zuravin,(Graduate of Yeshivos of Philadelphia, Mir New York and Kollel Iyun HaTalmud, Yerushalayim and son of Rabbi Ephraim Reuven Zuravin, Rosh Yeshivas Kneset Beth Aaron, Yerushalayim), Rabbinic Co-Ordinator with special responsibility for wine productions and factories in China. Rabbis Aaron Cousins, Feivel Berger, and Yankel Eckstein look after plants in Europe, and Naphtoly Lauer and Ilan Grossman control hashgacha operations in the UK. Co-ordinating the thousands of inspections required, liasing with factories and Mashgichim and maintaining hundreds of legal contracts, is the role of Rabbi Raphael Meyer, the overall factory certification Co-ordinator. He may be office based, but virtual non-stop use of his phones, faxes, e-mail, and mobiles keeps him up to the minute on the details of London Beth Din productions across the globe. The Kashrut Division maintains close working relationships with all other major Kashrut agencies including the Badatz, Rav Landa, the OK, Star K, and Kof K, and liases with the OU offices virtually every day. Rav Zushe Blech has started to work on a consultancy basis for the Kashrut Division and recently completed an inspection tour of LBD plants in Malaysia and Singapore. If Chazal said "Ein Beit Hamidrash Belo Chidush", it is equally true to say ??? ??? "Ein Beit Chidushat Belo Chidush". As food technology becomes increasingly sophisticated, so Kashrut agencies must constantly develop and grow and can never afford to rest on their laurels. To distinguish between the impure and the pure: Says Rashi: It is not enough to know the laws superficially, but one must know (the practical ramifications) and recognise (potential problems) and become expert in them." It is our aim at the Kashrut Division of the London Beth Din to live up to these ideals.